I’m excited to announce I will be speaking again at the Manchester front-end developer meetup McrFRED 55 on November 30th. McrFRED 55 (it’s hard to believe this is the fifty fifth event!!) is a freelance special so I’ll be chatting about my experiences working for myself over the past 3 and a half years and lessons learnt along the way. If you have a question you’d like answering about working for yourself please feel free to either contact me here or send me a message on Twitter. I previously did a talk at the last freelance special 2 years ago and had a hoot so it’s a pleasure to have been invited back. 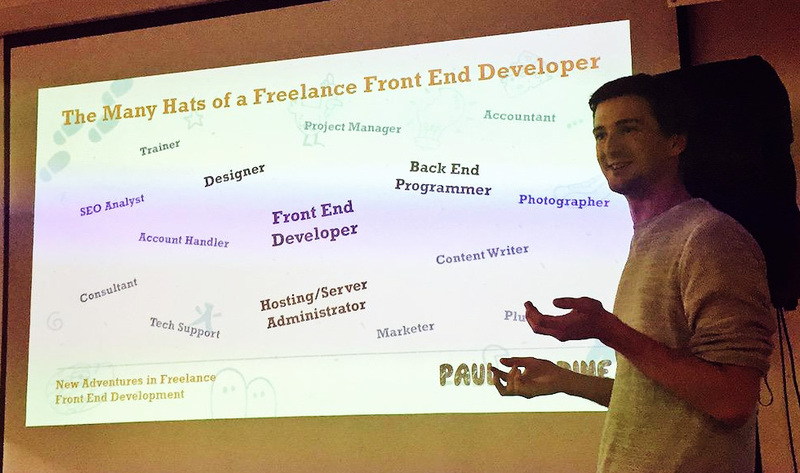 A slightly more youthful looking me speaking at McrFred 30 back in 2015 about running your own web design and development business. Fun fact about me: I decided to go freelance myself after attending back in 2013 so it’s a pleasure to be invited back to hopefully inspire a few more people to take the plunge into self-employment! I’ve learnt loads of cool stuff and met some great people over the past 5 years attending McrFred events so I’d be delighted if you come along to hear me talk this month. McrFred 55 will take place on Thursday November 30th 2017 at SpacePortX in the Northern Quarter. Talks start around 6.30pm and tickets are FREE! Check out the Meetup page for more information.